Vaccines, like all medical interventions, can cause harm. The important thing is that vaccines cause less harm than the diseases against which they provide protection. Although very rare, certain vaccines may cause an allergic reaction in some people. If you or your child has a known allergy, talk to your medical provider about your concern. Some vaccines, like the original rotavirus vaccine or a vaccine for H1N1 flu in the 1970s, caused more harm than good by making people almost as ill as the diseases themselves. Those vaccines were pulled off the market and replaced with better, safer vaccines that protected patients from the harmful effects of the original diseases. It’s important to note that no vaccine recommended for use has been found more harmful than the disease. Over the several decades in which vaccines have been readily available to us, only a few vaccines have been recalled because they were found to cause almost as much harm as the disease itself. In comparison, consider medications for treatment of a disease. Medicines intentionally alter your body’s function and sometimes have vastly different effects than intended. Vaccines, on the other hand, work with your body and train your immune system to fight against harmful diseases. So, what about reports that vaccinated people still get sick? To understand the numbers, you have to look at the total population and not just the outbreak. 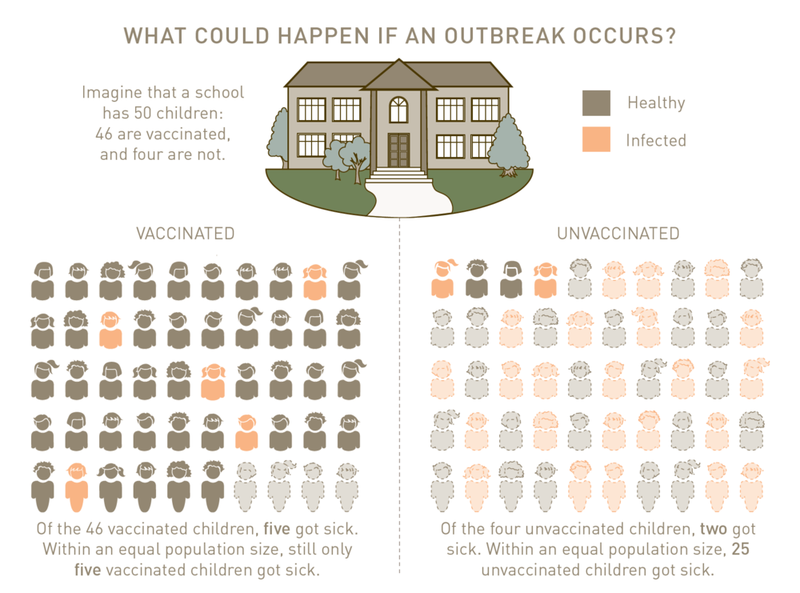 Imagine an outbreak in a school where seven children get sick, five of whom were vaccinated. You might think that the vaccine isn’t helping anyone or that it even makes things worse. But you must consider the total population of the school: 50 children in total, 46 of whom are vaccinated and four are not. Of the 46 vaccinated children, five of them got sick, which is only 10% of all the vaccinated children. Among the unvaccinated children, two of them got sick, which is 50% of the unvaccinated children. It only appears that the vaccinated children have more illness because more children are vaccinated. If 50 children were vaccinated and 50 children were not, there would be five vaccinated children getting sick (10%) and 25 unvaccinated children getting sick (50%). So, it is important to compare equal population sizes to get the full picture. "Terror is the word I use to describe what it feels like to learn that your child has cancer. A chill that takes over your body, rapid heartbeat, mind racing. But we cheered in our 6-year-old daughter’s hospital room when told that her type of leukemia has a treatment plan with a high cure rate. It would mean more than two years of bone marrow biopsies, surgeries, transfusions, spinal taps, and chemotherapy. So much chemo. The drugs would kill the cancer and save her life, but they would also kill her immune system, leaving her vulnerable. We did what we could to keep her safe as she endured the treatment—stocking up on hand sanitizer and limiting where we took her. Weeks were spent trapped in a hospital isolation room when fevers struck. We did our best to push aside the terror and keep our family thriving, but I could not stop the terror when told that there was a child with whooping cough at my daughters’ school. Nor could I stop it as we canceled our trip to Disneyland during the measles outbreak. Our loving community that cooked us meals, helped care for our other daughter, sent our children gifts; the wider community that made a custom wig, built a dream playhouse, and provided a special getaway. I will never forget the waived dental bill, or the unordered donuts that appeared with a hot chocolate. There are so many kind people who wanted to help. I long for a day when all forms of cancer have a treatment plan. I hope that the treatments we do have can become less toxic. In the meantime, I want everyone to know that they can help. Vaccinating your children and keeping your community healthy are the most important things you can do to help all people with cancer." Next: What About the Aluminum in Vaccines?